Night Scented Jessamine plant, Cestrum nocturnum, is sometimes known as Lady of the Night. Night Scented Jessamine bears delightful honey/musk/almond scented flowers. Aroma permeates the air in summer evenings. Night Scented Jessamine plant is a native of South America and prefers rich, moist, well drained soils in protected, sunny position. The flowers are tubular, greenish yellow and strongly perfumed at night. Scent is reputed to repel mosquitoes. Drought and frost tender – will tolerate light frosts. 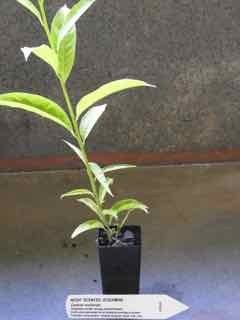 An evergreen shrub, growing to 2.5m x 2m.